Daath have long been the underdogs of American death metal. 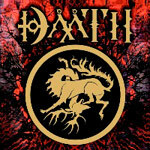 Insanely talented, blessed with lyrical imaginations most of their peers will never possess, and possessing a wonderful knack for brutalness, Daath should be reigning up there next to the greats. Unfortunately, in a scene cluttered by your Job For A Cowboys and Whitechapels plus everyone else in between who sound like the aforementioned deathcore titans, it's a little difficult to really standout. 2009's immense outpouring of sophisticated sonic extremities The Concealers was a career plateau deserving of a better sequel. Now here comes a self-titled offering whose only goal should be to out-perform its predecessor. Does it? Unfortunately it doesn't. No doubt it's a solid album showcasing the now permanent Daath ingredients�Sean Zatorsky's vocals married to a blizzard of twisted buzz saw riffs from the Eyal Levi-Emil Werstler duo�but there's still something amiss here. What is it? It must be memorable songs, because despite the excellent cuts throughout the album there are a handful of awful clunkers that leave you cold and feeling short-changed. In more precise terms, for every magnificent Destruction-Restoration there's the pummeling drudgery of Exit Plan that zips by in a few supercharged minutes and then vanishes with barely a halfway decent impression. Why? The underlying flaw that almost ruins the otherwise beautiful complexity of Daath is a criminal lack of hooks. Sure, this may run against the ethos of the Daath sound, yet if only songs like Manufactured Insomnia and Oxygen Burn made that extra effort to ensnare the listener, Daath the album would be light years more enjoyable. As it stands however, Daath the band haven't pooped on themselves here and hurt their legacy (unlike, say, Children of Bodom). Instead, the band has efficiently delivered an uncompromising death metal barrage that's just what it is, a barrage; to hell with the collateral damage and disappointment over the boring parts. To wrap things up, the musicianship on Daath still packs the same breathtaking punch to the nuts; the production is exquisite and Kevin Talley's drumming is seismic chaos. As last remarks go, this writer would like to moan about the whole self titled issue. Self-titled nowadays? Dudes, use lyrics or even songs to name the album. Imagine if this were called A Cold Devotion instead of just plain boring Daath. Epic! To wrap things up, the musicianship on Daath still packs the same breathtaking punch to the nuts; the production is exquisite and Kevin Talley's drumming is seismic chaos.